Today a spring thunderstorm moved through Burlington and unlike the last storm I was here to watch it. I was in the third floor of a UVM building which meant great views, but an inability to turn off the lights and a weird tinny quality to the thunder heard within the building. This storm was surrounded by fog and clouds so I didn't get any particularly impressive photos. Still, it was fun to watch and I did get one good picture of the low clouds floating around the bottom of the storm. The rain did flow into the Jeffords rain gardens, though nothing is growing in them at the moment. Unfortunately, Lake Champlain has been at flood stage for over a week due to melting snow and heavy rain and this will not help matters! 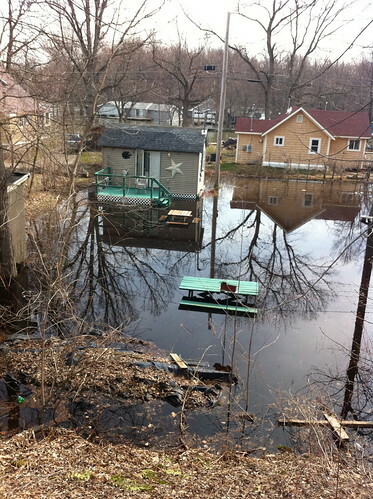 I took these pictures last Friday and the lake will probably be rising a bit from this point. If anyone has noticed that I haven't been making very many blog entries... the reason is that I have been frantically trying to finish everything I needed to do so I could graduate from grad school! Today I sent off my final project draft, so all I have to do is one more low-stress landscape analysis/question and I'll be done! This blog was created as part of my grad school project, but I am going to keep it going, at least for now. My friend sent me a link to Google Map Maker, a companion to Google Maps that is editable by anyone. I quickly tossed on a few features of Centennial Woods and if I get time I will add features in Schenley Park later. Give it a try! 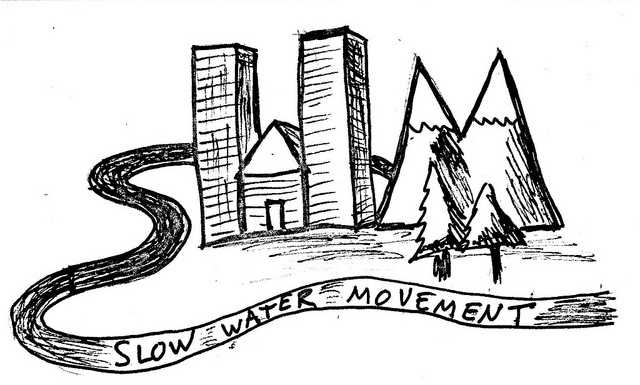 The Pittsburgh Parks Conservancy is holding a lecture about how water moves through Schenley Park. While I won't be at this lecture, lots of good people will be, and it should be extremely interesting. The lecture is on April 27 - click here for more info. 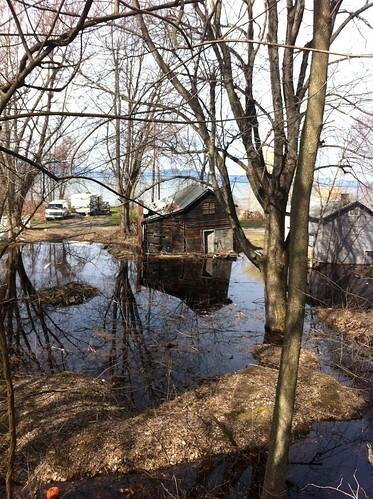 Meanwhile, in northwestern Vermont and northeastern New York State, Lake Champlain has risen above flood stage. A storm is going to bring more rain, and perhaps worse, wind that will whip up the lake and cause more erosion and flooding, especially on south-facing shorelines (of which there are not very many). The next week looks to be rainy so the lake will probably remain above flood stage for a while. With near-record snowfall across Vermont, it seemed inevitable that there would be at least some flooding when it came time for the snow to melt. Last weekend we experienced warm rain with some areas seeing thunderstorms as well. The temperature also shot up to near 80 in many places. With heavy snowpack still present in the Green Mountains, this has led to some flooding. Despite dire drought conditions and the onset of a La Nina, most parts of California experienced a wetter than average year with several strong storms smashing the coast and dozens of feet of snow dumped in the Sierras. While this plentiful supply of water has temporarily ended concern about water shortages in the state, it also has brought with it a need for runoff management that retains and cleans urban runoff. 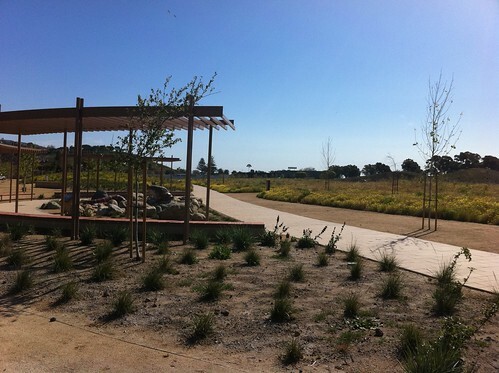 As such, it was a great year for the debut of Malibu Legacy Park, a park in Malibu, California including native plant landscaping and a huge 'bioswale'.